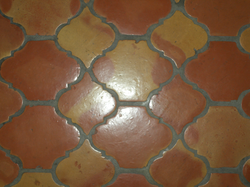 Mexican Tile has a timeless beauty that is unrivaled by any other building product out there. You can usually tell what year certain homes where built in just by their appearance. The 1970's, 80's and 90's all had their distinctive trendy look that rapidly becomes outdated. Not so with authentic Mexican tile! When you see a home with the beautiful earthy shades of the tile offset by colorful Talevera, you can't help but have your breath taken away. It truly is beautiful. Arguably the biggest company out there selling this stunning product, Mr. Doyle Dean and FlaMex Tile have been doing this for over forty years! And you don't have a business last that long if you don't know your product. And Doyle knows Mexican Tile. Give us a call or drop in to check out the beautiful sinks, tile and accessories that we carry! Order today, pick up today or have it delivered! We have a massive warehouse full of inventory so when you call and place an order for 1200 square feet of 12" saltillo tile, we generally have it here. Which means you don't have to wait for two or three weeks for the tile to come in - like you'd have to do with our competitors. Questions? Give us a call and we'll chat! We'll deliver to Tampa, Orlando and pretty much any where in Florida! And if you don't have time to call? EMAIL US HERE and we'll be in touch. We are conveniently located in West Palm Beach, near I 95. Come on by and drop in if you are in the area and we'll show you our selection of Mexican clay tile (saltillo), Mexican pavers, Mexican pottery and decorative Talavera tile, Talavera pottery and Talavera accessories. We serve customers in Palm Beach, West Palm Beach, Stuart, Palm City, Vero Beach... basically all the Treasure Coast buys Mexican saltillo tile from us!